How to Beat the Heat and Keep Your Pup Cool this Summer! Dogs and heat don’t mix. With summer heating up, make sure you’re prepared to care for your dog during these sweltering months. Overheating is very dangerous for your dog’s health, so be sure to keep your pup’s temperature top of mind when you’re out during the day, or if your home isn’t air-conditioned. Dogs can’t sweat, so when they get too hot they pant. If you notice your dog drooling excessively, acting lethargic, having bloodshot eyes or appears paler than usual, then you should make sure to immediately get them water and get them to a cooler location. Basements, cool beds or air-conditioned rooms are good places to help your pup cool down. One other sign of dehydration is if you pull their skin and it takes longer to fall back into place. Dogs with dark fur or ones that are overweight are more at risk for dehydration. The best thing you can do for your four-legged friend is be prepared for the weather before it’s too late. Plan Ahead —Your Pup Will Appreciate It! Get your morning walk in before the sun comes up. Without a walk, your dog will be anxious and antsy during the day, so getting your walk in before it gets too warm will help keep them relaxed during the warmest hours. Walking later at night after the sun goes down is also a good idea. Bring dog booties, or keep a pair in your car. Heat rises from the ground, so booties will help your dog’s paws from getting burnt by hot pavement or other surfaces. Keep a water bottle and a towel in your car. Water can come in handy if your dog gets dehydrated, or you can use it to wet the towel and help cool your dog down. Make sure to use the towel on their paws and stomach, as these areas cool their bodies the quickest. When you’re hanging around outside, providing your dog with a wet towel to lie on or a sprinkler to run through can help to keep their body temperature regulated. A kid’s pool is another fun way to give your dog its own area to cool off. Never leave your dog in a car. Even with the windows cracked, heat can’t escape quickly enough to keep your dog cool. 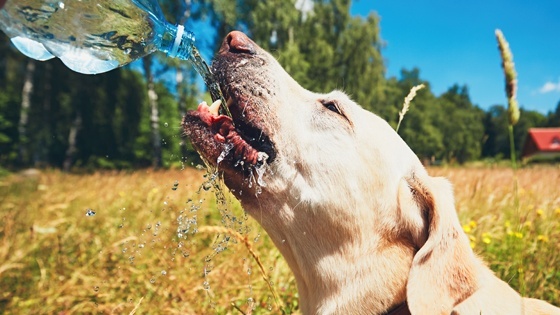 Most importantly, always keep track of your dog’s temperature and make sure to contact your veterinarian if you notice your dog displaying symptoms of dehydration or heat stroke. Contact us to learn more about how our smart pet technology is drastically changing the way you care for your dog. The Wagz™ Explore Smart Collar can take your dog’s temperature, ensuring they are always cool and comfortable.